China plans to further promote its opening-up this year by granting more access to foreign investors in a number of sectors and eliminating joint-venture requirements, according to the nation’s top economic regulator. These industries will include agriculture, mining, manufacturing, telecommunications, education and medical care, Meng Wei, spokeswoman of the National Development and Reform Commission, said on Jan 22. “The NDRC is working with a number of departments to clear up the restrictions on foreign investment that are not on the negative list. We will make sure that domestic and foreign standards for market access are consistent,” Meng said. She added that the government welcomes foreign investors’ participation in China’s efforts to upgrade its manufacturing sector. 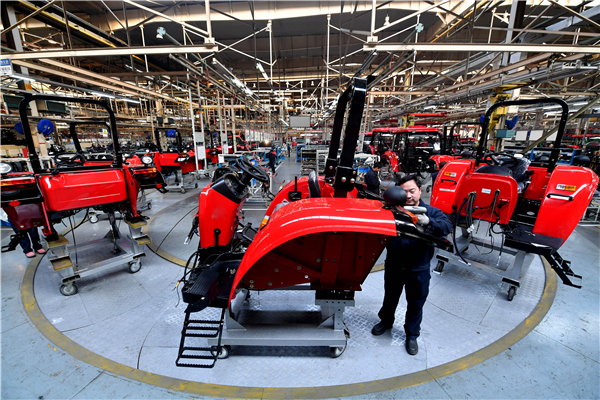 The park is part of China’s efforts to combine local manufacturing strengths with investment and more advanced techniques to improve the region’s economic restructuring process. Bai Ming, a researcher at the Chinese Academy of International Trade and Economic Cooperation, said Chinese enterprises should take the nation’s further opening-up as an opportunity to upgrade and be prepared to face challenges brought by foreign firms seeking access to the domestic market.